For most of us, despite our differences, would fit into these categories. Ironically, often we search until we can find something that makes a person different from us. It is almost as if saying, “That person is a lot like me.” Somehow diminishes either one of you. When we understand that we all share the same basic needs and wants, judgment and hatred become all but impossible. If you are a person who loves others and does not want to harm them, and reading a blog like this it would be a safe assumption you are, then it would serve you well to surround yourself with other like-minded individuals. Does it really matter where on this planet they are from? By writing these posts I have met and befriended many other like-minded souls from over 100 different countries. They have brought not only a unique perspective, but a great deal of joy to my life. Does it really matter what color they are? I am blessed enough to have friends of every race. Not only does it include many great and loving people, but our pictures together are a lot more colorful. Politics? Ooh…that is a good one. Quite often we can almost be at each others throats because of different ways to address the same problem. Instead we should focus on the fact that we are both trying to solve the same problem. Maybe their solution takes into account something we overlooked? Maybe a combination of both solutions would work the best? We will never get to that point if we busy ourselves with such low level minutia such as what political party is the correct one. Even my wonderful friend Nick who sent me this picture, and by doing so inspired this post, has different opinions than me on a wide array of different subjects. Do you know what? That is great to me. Often when we talk he will bring to my attention a way of looking at things I had not considered. Even on subjects where we just ‘agree to disagree’ we still have the same respect and admiration for each other. Not only is it ok with us that we are different in some regards, but it is quite cool that we are also the same in many ways. It is that similarity that prompted him to share the above picture with me and allowed me to share it with you. Today, celebrate the fact we are all a little different, and when it comes down to the core of who we are, most of us are really the same. Both of those should be reasons to celebrate with your fellow humans. WHAT THE HELL HAPPENED IN VEGAS?? It is a little past noon as I write this. I’m sitting in Urban Joe’s, a quaint coffee shop in West Allis, Wisconsin where I live. Curtis, a very charming and congenial young man is working with his wife Danielle. It would seem to be the prefect Monday, with one exception – Las Vegas. Last night was the deadliest shooting in US history. 58 innocent people lost their lives. People on the television as well as in the coffee shop are musing as to what the motive may be and how could this even happen. Questions you may be asking yourself. Routinely I am asked if the world seems to be getting worse. We hear about terror attacks across the globe and right next door. The level of divide between people seems to be growing. To me the answer is both ‘yes’ and ‘no’. I believe, sadly, this sort of violence has been around nearly as long as mankind has. If we review the pages of history we can easily find examples of that. What has changed is the ‘closeness’ of the world. We can hear what happened across the globe seconds after it has transpired. We also hear about every incident. News that used to be relegated to the town it occurred in can now be viewed online by someone half way around the world. There are two things I would like point out at this time. First is not to give in to the going of fear being pushed on us by the media. Let us not start treating each other with harshness based on judgements we have come to from world events. When we hear about certain groups of people perpetrating crimes it is easy to fall victim to the temptations to pass that judgement on to others who may belong to that group. The only way for us to overcome the social challenges that face us is through treating each other with love, respect and compassion. An “eye for an eye” mentality can only lead us to a blind world. In the wake up both this tragic event, the recent hurricanes and earthquakes we have seen a flood of people rushing to help from across countries, to across the globe. These heroic efforts can get lost in the deluge of reporting on the Loss of property, lives and love for our fellow humanity. I encourage you to dig deep and read a few of these. See even in the darkest hours of humanity there are always beacons of light. Stay in love and light my friends. As we watch what is going on in our current political climate i am reminded of my great friend Cari. That is a picture of her above. 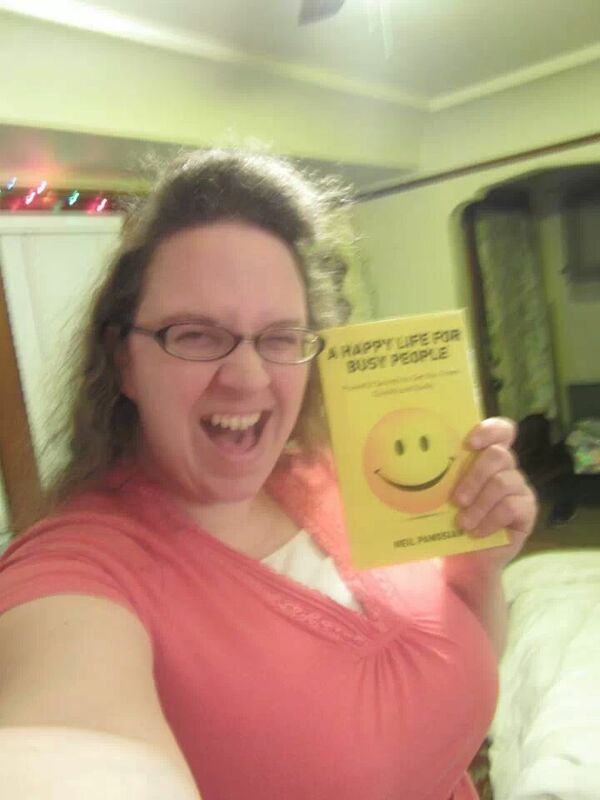 Not only does she obviously have great taste in books (you can get a copy of that very book by clicking this link A Happy Life for Busy People) but she is one of the sweetest people I have the honor of having in my life. Cari literally will help anyone and everyone she can. When her friends are hurting, she is hurting. She is a great listener and has a kind word about everyone. She even bakes amazing cookies. Other than the fact I am grateful for my friend and can take a moment to brag on her,what is this post about? Here is something about Cari and I, when it comes to some very important issues we have major differences. We are both very spiritual people and lean heavily on our faith. It is one of the things that I respect most about Cari. She stands by her beliefs even when it is not the easiest thing to do. She also does her very best to not only stand by them, but live her faith as well. She ‘walks the walk’. She also expresses her faith quite openly. One evening Cari and I met for dinner which ended up lasting several hours. We discussed at length our beliefs and how they would apply in certain situations. We discovered on a lot of issues, important ones, we were miles apart. On others our views were in direct conflict with each other. A discussion like that could lead to conflict between the two individuals. How often have we heard never to discuss religion and politics? Here is what came of the evening with my friend. We expressed our views openly and passionately while the other party listened with the intent of understanding and not to ‘correct’ or even contradict each other. On several issues we agreed to disagree and on others even incorporated each other’s belief to gain a more complete understanding. The reason i bring this up is to encourage all of us to do the same. We can obviously see on a bigger scale governments having difficulty doing this, but it starts at a fundamental level between two people. I encourage us all to search for common ground and learn to agree to disagree. You can certainly respect someone and their convictions even if you do not agree with them 100%. Feel free to share any ideas you have for doing so in the comments below. This comes from the religious text of Islam. Without being Muslim myself, I have personally used this great secret often. Read the quote again. It shares with us the plan for turning enemies into friends. It also tells us what to do when we are faced with a negative, or evil situation. What is that? Repel it with what is better? Someone treats you harshly, treat them with love. Someone continually expresses views contrary to the ones you express? Treat their opinions with respect and consideration. Is this easy? Not at all. Then why should we do it? Why, as the Quran urges us here, should we take the high road? 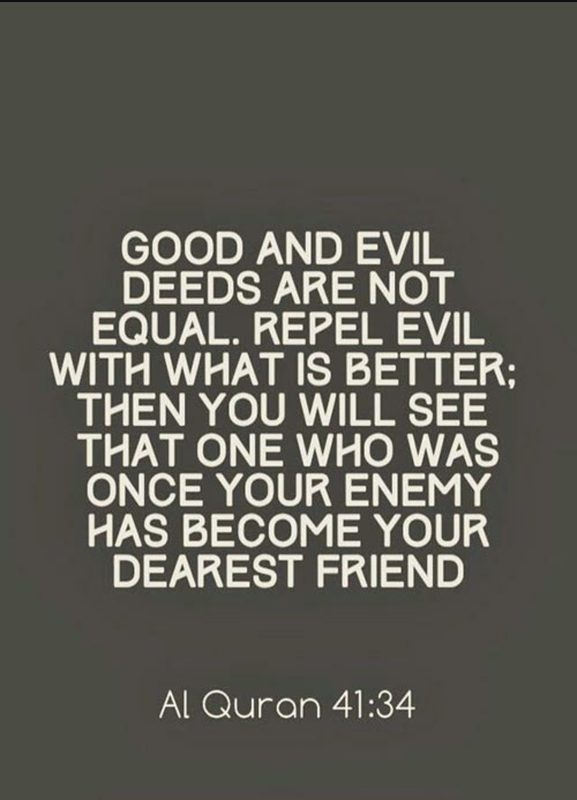 If you look at the beginning of the quote is reminds us that good and evil deeds are not equal. Meaning that in the long run, doing good will be more powerful than doing bad. Thus, the quote instructs us to repel evil with what is better, not just what is opposite. I am a firm believer that good will always triumph over evil. Hitler, Stalin and lots of other famous evil doers had the final years of their lives filled with paranoia and suffering, even though at periods of time it seemed they may never be toppled. Another reason why we should always counter evil with good, negative with positive is stated in the final line of this quote. The one who was once your enemy has become your dearest friend. Enemies are a lot of stress. When we know there is someone who is against us we must always be on guard for deception and wrong-doing. This drains us of a lot of energy and physical well-being. So how do we turn enemies into friends? We cannot do so by force, or by proving our points or our person as superior to their own. The French revolution should be evidence of this. No, the only way we can turn the hearts of our enemies is through Love and compassion. The two most powerful tools against hate and evil. Tomorrow we tie everything we have learned this week with one amazing example. I look forward to sharing that with all of you. This has always been one if my favorite bumper stickers. Recently the tragic events in Orlando have sparked some interesting debates. I have heard people speak out against the LGBT community, I have heard certain people speak out against the Muslim community. There have been arguments on both side of the gun issue. There have been both praises and criticism of law enforcement and government. I even heard a republican broadcast mention the shooter was a registered democrat. Whenever tragedy strikes people want to look for something to blame. It gives them comfort and a false sense that they can correct the ‘problem’ once they assign blame to what they think the problem may be. It is this kind of thinking that is the problem. Your sexual orientation does not make you kill people. Your ideology does not make you kill people. Certainly what political party you vote for does not make you more or less likely to commit violent acts. Yes, it would be easy (and very naïve) to say all members of this religion are bad, or if you vote in this political party you are to blame for all of the worlds ills. When I hear statements such as this it makes me think the person making them is not very well educated. So what does cause people to harm others? To be filled with such hate that they resort to violence? It is the inability to coexist with others who are different from them. There are over 7 billion people on this planet and if we cannot get along with others who may do things that we would not every day will be a long day. I am not saying you have to be in agreement with everyone that would be ridiculous and very boring actually. Still, being able to afford others the right to believe the way they do even if we do not agree with it is a sign of a mature and cultured individual. I am not gay, but I have quite a few friends who are. To expect them to be straight because I am makes no more sense then if they were to ask me to be gay because they are. I am not Muslim so I do not celebrate Ramadan, but I certainly wouldn’t want to prevent my friends who do from doing so. Ok, so what then is the answer to all of this senseless violence? I believe it is compassion and knowledge. For years I have encouraged people to explore other cultures and beliefs. If you do not agree with someone or something, get to know more about it. You may still not believe the same thing, but it will help you appreciate why they believe as they do. There have been several times when people I know who “hate” this group of people meet one of my friends who happen to fit into that group of people and tell me how nice they are. After they find out they belong to a group that the person believes is no good they end of feeling a little confused, silly and sometimes angry. I have even seen this with members of my own family. It is through this positive exposure that minds are slowly changed and beliefs questioned. So what can we do? What is our part of the solution? First, learn all you can about the people you meet. Look for the good in them. Second, whatever you are, be a good one. If you are gay, be the nicest, most helpful gay person you can be. If you are a republican, be the most caring and compassionate republican you can. That is the only way you can truly change someone’s beliefs is through experience and education. Share all the positive aspects of who you are. If someone voices a strong dislike for it, try reaching them through education and compassion. If they persist in their hate all you can do is be shining example of how wrong they are and the only way to do that is by being an amazing human being. Lastly, share this post. Let us educate everyone and let us all do our part to get along with those we may disagree with the most.